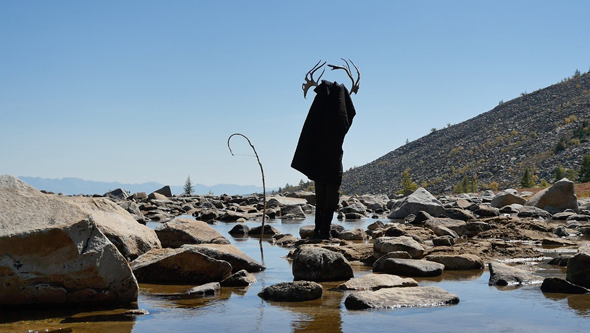 Les Joynes in Shapeshifter (still), 2014. Video, shot in Khovsgol Province, northern Mongolia near Siberia. © FormLaboratory; ARS, New York and DACS, London. New York artist Les Joynes (US) exhibits FormLaboratory, a multi-country exhibition series in museums that re-activates how the spectator views artworks not only as finished objects but also as process and happening. FormLaboratory was founded in 2007 as a collaborative space for intercultural creative experimentation. This year FormLaboratory exhibits in Ulaanbaatar, Mongolia at Zanabazar Museum of Fine Art (September 16–30) and Gallery 976 (September 23–October 12). The advancement of globalization, communication and cultural exchange have prompted artists to search for new and significant ways of making art in an effort to create communities and initiate cultural dialogue. FormLaboratory entreats museum audiences to experience art making as a constantly evolving process. The mutating and radical nature of trans-cultural collaborative process in the gallery leads to unexpected discoveries and brings new meaning to the notions of local and global art communities. Using combinations that hybridize disciplines leads to advancement in the arts. At Zanabazar Museum, FormLaboratory presents a series of art and music performances created inside a traditional ger, a Mongolian nomadic habitat, reconstructed as a see-through laboratory. For FormLAB-5, Joynes works with artist/designer Hagen Betzwieser (Germany), contemporary artists from Blue Sun and Human Nature Love Freedom, Mongolian contrabass/ix xuur musician Monkbat Myagmarjav and contemporary dancer Enkhgerel. Participants from Blue Sun (Mongolia) include artists Dalkh-Ochir, Enkhbold, Batkholboo, Batzorig, and Ganzug. Also collaborating are contemporary Mongolian musicians and artists Davaajargal Tsaschikher (Mohanik), Tsogt Sambalkhundev (Mohanik), Dorjderem Davaa, and Khulegt Battulga. Each of these participants are considered pioneers of contemporary art, music and dance in Mongolia and have exhibited and or performed in galleries, museums and other venues in Europe, Asia and the USA. FormLaboratory has exhibited at the Brazilian Museum of Sculpture, São Paulo; Seoul Foundation for Art and Culture, Korea; Treignac Projet, France and Chashama, New York. Works from the LAB will be exhibited in 2015 at the Museu de Arte Brasileira, São Paulo. FormLAB-Mongolia is supported by the US Department of State; CEC ArtsLink, New York; The Mongolian Ministry of Culture and the New York Foundation for the Arts (NYFA) ArtSpire Program and has received prior support from the Brazilian Ministry of Culture; Brazilian Museum of Sculpture; and the Seoul Foundation for Art & Culture, Korea. Les Joynes is an artist from California and is based in New York. He is founder of FormLAB. He has an MA from Goldsmiths, London and PhD from Leeds Metropolitan University, UK. His work has been featured in museums and galleries in Europe, the US and Asia and he is represented by Thomas Jaeckel Gallery, New York. Hagen Betzwieser is an artist and designer from Stuttgart. He is technical advisor and curator for FormLaboratory-Mongolia. He has an MA from Merz Akademie, Stuttgart and is Fellow of Akademie Schloss Solitude, Germany.